In 1500 few Europeans regarded nature as a subject worthy of inquiry. Yet fifty years later the first museums of natural history had appeared in Italy, dedicated to the marvels of nature. Italian patricians, their curiosity fueled by new voyages of exploration and the humanist rediscovery of nature, created vast collections as a means of knowing the world and used this knowledge to their greater glory. 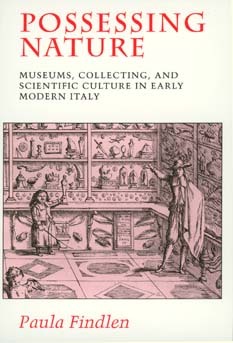 Drawing on extensive archives of visitors' books, letters, travel journals, memoirs, and pleas for patronage, Paula Findlen reconstructs the lost social world of Renaissance and Baroque museums. She follows the new study of natural history as it moved out of the universities and into sixteenth- and seventeenth-century scientific societies, religious orders, and princely courts. Findlen argues convincingly that natural history as a discipline blurred the border between the ancients and the moderns, between collecting in order to recover ancient wisdom and the development of new textual and experimental scholarship. Her vivid account reveals how the scientific revolution grew from the constant mediation between the old forms of knowledge and the new.